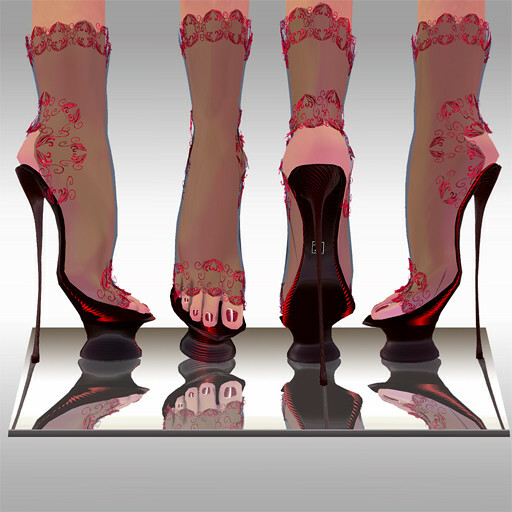 24 Shoo Shoes | Welcome in my Secondlife store-catalogue! Welcome in my Secondlife store-catalogue! Disclaimer: The 24 Shoo ShoesCompany will not be held responsible for the broken hearts of the gentlemen that may see you occasionally wearing Wow! No.5 shoes and fall in love with you forever in an instant. They should understand that you cannot marry everybody…or can you (at least try…please-please)? We will not be held responsible for their scandals, weeks of feeling dizzy and crazy, neither for totally destroying their reputation of serious stubborn cold-hearted men. We will not to be blame for their logging in SL at strange hours, blushing while hearing your name, forgetting to go to work or to bed while you are still on-line. Tender falling scarves, very high heels. Wearable with trousers, dresses and gowns, delicate toes with 254 options by hud in skin tones as textures, matching the best skins ever created by hud and 26 nail enamels. Playful curly knots on the ankle, very high heels. Wearable with trousers, dresses and gowns, delicate toes with 254 options by hud in skin tones as textures, matching the best skins ever created by hud and 26 nail enamels. Wow! No. 33 sandals with feet! They are inspired by the delicateness and vulnerability of a soul when it comes about love…I made them in pieces of hand painted porcelain (remember that sound of intimate celebration with two cups of liquid tenderness? ), and I placed them high above filigree platforms. The extreme heel is made in lace of precious metals too… you are invited at 24 Shoo Shoes ! Dear ladies, this new pair of 24 Shoo Shoes sandals with feet is a mixture of feelings: naked hot and so barely wrapped in the fluffiest angora fur, far better than any fur quality ever saw in SL, made in a secret technique just for you to experience the cutest emotions ever and to spread around a mixed feeling of tenderness and sensuality. The filigree bracelets around the ankles and toes give the most beautiful legs in all SL a luxurious look. 2.Cross your legs in any position you free body would move…no more disappearing parts of your perfect avatar! 3.FAQ: would everybody se my feet correctly? This is only up to you: if you are on Viewer 2, you will be seen properly by everybody, no mater what viewer they may use. 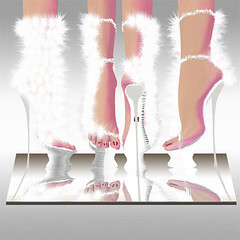 The sandals come in ready made 2 sizes, as for the Model look and as for the “Betty Boop” look. Dear ladies, Wow! No. 35 are made in the best 3D lace ever seen in SL, embrioided with shiny coloured silk wires on tulle (yes, black tulle), so detailed and elleborate that they would to make any gentleman think that if they are too hot to resemble what you are wearing, they certainly resemble your lingerie. You know that they consider a mistake the fact you are actually wearing anything else :)) See the NC inside and blush!